Fall is school, and therefore school projects. 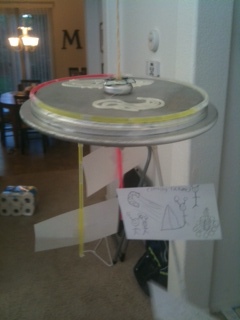 The kids had already read their books and picked out the projects for the “visual book report” they were to do. Most kids pick a hangar and draw some pictures. Mine . . . well, they had to get creative. One son picked a book called “Noah Barleywater Runs Away”, (http://www.johnboyne.com/ is the author’s website) focused on apple trees and a mystery in the woods. 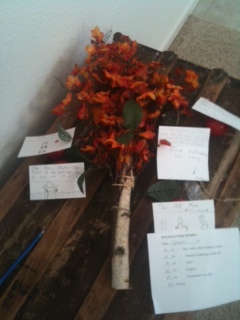 So obviously we had to make a tree and post the note cards on apple branches attached to the turning leaves. The other: “Aliens on Vacation”. (http://www.cletebarrettsmith.com/ for that author) Naturally, we had to make a UFO. I both adore and despise the store Michaels. I adore the fact that I can get most the art materials I need. I loathe the fact that I HAVE to go there and pay through the nose for something that I could make on my own if I’d thought of it a week before the due date instead of the day before, like we inevitably were. So we used a tree branch, fake leaves and fake apples for one; Silver Krylon, upside down Lazy Susan platters and glow bracelets for another. This well before I had to put together the next day’s stuff. Weekends were always made for us to put the breakfasts and dinners together for the week. Why? I HATE mornings. Can’t wake up, never could. But my mom always made us breakfast. Even if it was Cream of Wheat she was up and made it, so I do it too. 6am, or earlier, I’m up. My method to ease the pain is advanced cooking. This week’s breakfasts? Pancakes. I was up until Midnight, cooking, cooling and sealing in Ziplocks, but we had buttermilk pancakes warmed in the toaster for days! The apple tree project reminded me of Andrea. She always had amazing ideas. I had to implement them a lot of the time, but that’s what a good partnership is. Fall is our time of year. A good friend told me not long ago that this was our season, we really pulled out the stops in the Fall. Our house was always decorated, the smell of pumpkin spices and ruddy colored candles and decorations filling the houses where we lived. That wasn’t what I loved. I always loved it for selfish reasons. The season always brought about a crisp bite to the air that cleaned out the pollen and haze of summer and made the colors bright. That, and we got to bundle up and be close. Andrea was gorgeous. There’s no disputing that, and I should have been thanking my stars that she put up with someone like me. In the fall she always was just so wonderful. Early on she’d have some sort of t-shirt with a pair of soft overalls, or a big brown sweater that you swore looked like corduroy but was really soft as silk. And it was the time of year to just be close. There was something irresistible about reaching out and just holding her: the contact; the feel of her cheek or the tickle of her hair on my nose. This was the time of year I wanted nothing more than to grab her and just never let go. Now, overalls are coming back, but not like I remember Andrea wearing. There’s something very alone about being in the cool morning air in the house and knowing you’re waking up to that same chill to see the vacancy on the pillow next to you. That, and her birthday was the day before Halloween. I always messed up her birthday. I can’t think of more than a handful that went well. My job, you see, is in television news, and the biggest, most important ratings period every year is November. The start of that ratings calendar was almost always the Thursday before her birthday. We’d done this for years, but she never could forgive the industry’s pull that kept me at work until the evening hours. We got in so many arguments, and I saw so much horrible disappointment in her face every year. I’d kill to try and fix those. It seemed such a big deal then. Now, I live with disappointing her knowing I couldn’t get it right. You can tell me all you want how much she knew I loved her, I live with this pattern of dysfunction forever now, with no way to make it up. She brightened up the house. I loved having her there to whisk through, pushing the boundaries of what we had to decorate any hovel in which we lived. Now we’ve reached our first Fall in our new life. We will celebrate the seasons, but without her it won’t burn quite so brightly.